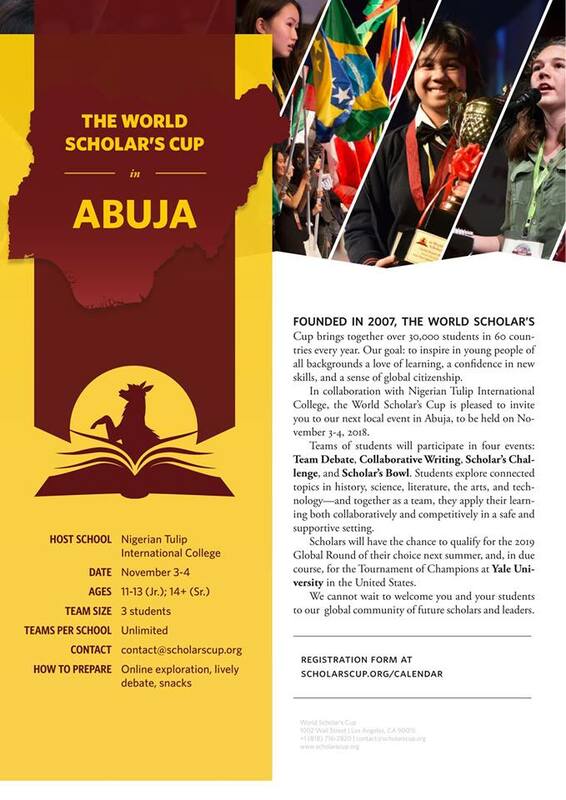 Apply for The World Scholar's Cup Competition Second Edition Holding in Abuja for Primary and Secondary Schools in Nigeria Hosted by the Nigerian Tulip International Colleges for 2018/2019 Session. The Second Edition of the The World Scholar's Cup Competition will be Holding in Abuja for Primary and Secondary Schools in Nigeria Hosted by the Nigerian Tulip International Colleges for 2018/2019 Session. It's time again for scholars to come together. The Second Edition of WORLD SCHOLARS CUP COMPETITION promises to ignite the love of learning, build confidence in new skills and inspire a sense of global citizenship. Call 08051908030 for more details on how to register your students or visit scholarscup.org/calendar to view the schedule. How to Prepare: Online exploration, lively debate, snacks.